Day 1: USA - THE HOLY LAND. Group members gather at the ticket counter at the airport two hours prior to our departure to The Holy Land. Dinner and breakfast are served in flight. Day 2: TEL AVIV. Upon arrival, we are met and transferred to our hotel on the Mediterranean Sea for dinner and overnight. Weather permitting we can take a stroll on the beach after dinner. Day 3: TEL AVIV – GALILEE. After breakfast, we drive to Jaffa, to visit the house of Simon the Tanner. Then, on through the citrus groves and farms of the rich land of Sharon, northward to Caesarea – the Roman city of Herod, where sights include Crusader fortifications and the Roman aqueduct and amphitheater. Afterwards, we drive through the Jezreel Valley to the fields of Armageddon (Revelation 16:16) and Megiddo. Continuing along the Mediterranean Sea, we reach Haifa and Mt. Carmel – the biblical site of Elijah’s contest with the prophets of Baal (I Kings 18). We then turn westward across Galilee and ascend Mt. Tabor (Psalm 89:12) via taxi and visit Deboriya – the hometown of the prophetess Deborah – at the foothill of Mt. Tabor (Judges 4 and 5). Overnight at our hotel on the shores of the beautiful Sea of Galilee. 8) and the present day Golan Heights where Israel, Lebanon and Syria come together. We follow the fresh mountain waters of Mt. Hermon to the Sea of Galilee and to the outlet passage at the southern tip of the Sea, where we stop at the beautiful Pilgrims Park on the Jordan River. Return to our hotel for overnight. 11) and Elisha’s Fountain. Then east through the Judean wilderness to the holy city of Jerusalem where we spend New Year’s Eve. Overnight at our hotel. 20) and the Tomb of King David. 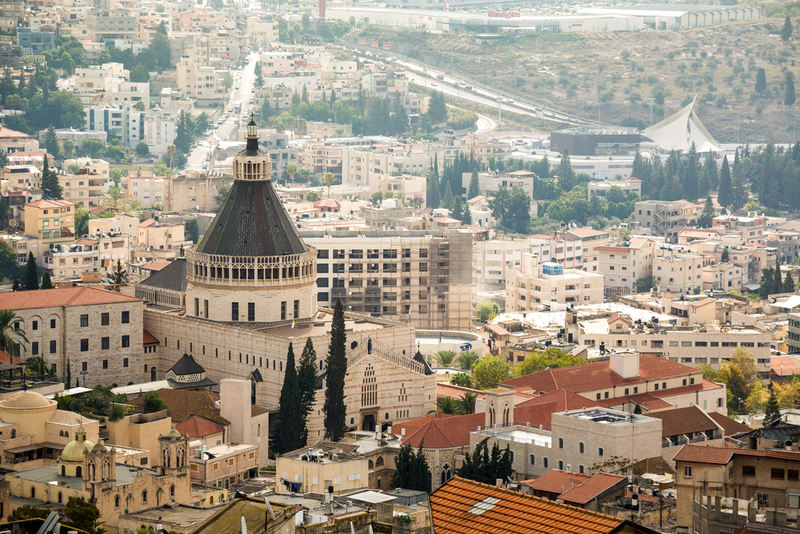 Continue to tour New Jerusalem: Hebrew University, the Shrine of the Book that houses the Dead Sea Scrolls, and the Model City of Jerusalem which depicts in miniature the Holy City as it appeared in the first century. We next visit Ein Karem before returning to our hotel for overnight. 17 & 4:13). We return to Jerusalem passing Rachel’s Tomb to our hotel for overnight. 46). On to our Jerusalem hotel for dinner and overnight. Day 9: TEL AVIV – ATHENS. This morning we drive to Tel Aviv for our flight to Athens. Upon our arrival at the Athens airport, we are met by our representative and taken on a panoramic tour of the city on the way to our hotel. Dinner and overnight. Day 10: ATHENS – CORINTH. This morning after breakfast, our sightseeing includes the Stadium and Temple of Zeus, Theatre of Dionysus and the Hill of Muses for a panoramic view of Athens and the Acropolis. See Mars Hill, where Paul addressed the citizens of Athens, and the monuments of the Acropolis – including the Parthenon, the Agora (marketplace) and Socrates’ Prison. This afternoon we visit the 11th century church, built in the golden age of Byzantine art, which contains a series of mosaics without parallel in the legacy of Byzantium. Crossing the Corinthian Canal which connects the Aegean and Ionian Seas, we see the isthmus where boats were once dragged from one sea to the other. Visit modern Corinth and the ruins of the ancient city where Paul worked with Aquila and Priscilla. We see the first century shops, Fountain of Pirene, the Temple of Apollo and the Bema Seat. Return to our hotel for dinner and overnight. Day 11: ATHENS – USA. Morning departure from Athens for our flight home – the close of our unforgettable journey to the Bible Lands.